Wallwood Garden hotel is a stately Scottish style place that was built in the 19th century and retains most of the charm. Not intended for guest room purposes the place was redone to equip it with all modern amenities. Sit amidst the beautiful gardens or enjoy a view from the rooms as you breathe in the fresh air and the beauty that is Coonoor. The hotel is 79 Kms away from the airport and 72 Kms away from the railway station. Popular tourist destinations like Law’s Falls (8 Kms), Ooty (19 Kms) and Dolphin’s Nose Viewpoint (10 Kms) lie in close proximity. The hotel has individually designed rooms named after flora and fauna of the place. The hotel is equipped to handle small conferences and its proximity to Coimbatore and Bengaluru make it a popular choice for office trips and conferences. The hotel organizes excursions to nearby places for their guests as well. The hotel is the recipient of Certificate of Excellence for the year 2013 from Tripadvisor. Suites transfer one back to Scottish days with its huge fireplace. There are 3 suites in the hotel called Silver Oak, Cherry Blossom and Camphor. The different suites can vary with the combination of double/single beds. The suite includes one/two bedrooms coupled with main room. They come with wooden flooring and furnished with period furniture carefully selected. Writing desk, dressing table and lounge chairs make up most of the furniture in the room. The huge windows present a scenic beauty that delights the eye. The Suite comes equipped with satellite T.V for the entertainment of the guests. The attached bathroom is spacious and nice. Grand Rooms are beautifully designed with period paintings and furnished richly with a four poster beds (single/double), dressing table and lounge chairs. Pine and Acacia are the two grand rooms. The large windows open out into the garden directly. The room has a large fireplace to keep you warm in winter months. Guests can enjoy satellite T.V as well. Attached bathroom is large and clean. 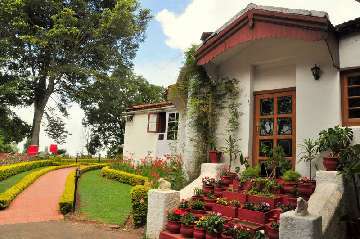 The hotel has 5 rooms named Eucalyptus, Red Cedar, Gulmohar, Jacaranda and laburnum. These rooms vary with the views they offer but come with the same amenities. The room is furnished with single (2)/Queen-size (Red Cedar) beds, writing desk, lounge chair and luggage rack. Some rooms connect to the verandah and others interconnect with each other. All the rooms offer scenic views of the surrounding gardens. There is satellite T.V in each room with a private bathroom. The restaurant serves authentic Tamil, Italian, Anglo-Indian and Continental Cuisine. The restaurant serves fresh Sea food and avoids frozen meats. The meal is a fixed meal where a lunch per person costs Rs. 350 and dinner costs 450. The variety is large and chosen at random so it is unlikely you wouldn’t find something favorite among it. Should you wish to try something on the menu that is not included in your dinner one can always request the Chefs. Chefs will do their utmost to cook your specialized meal as well. The view of the garden is a great way to accompany your food with.